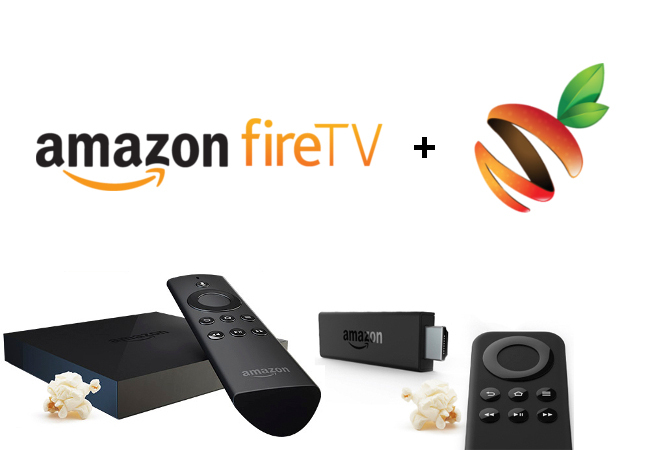 We are pretty excited about enhancing our digital signage player software to support the Amazon Fire TV product line. What this means for consumers is that you can turn an existing TV into a digital sign for less than $40. Amazon offers 2 flavors of the Fire TV that allow you to stream video, or run Amazon apps through the device. These are the Fire TV Stick, and the Fire TV Box. The Amazon Fire TV stick is a small device that simply plugs into the HDMI port on your TV and requires wireless network access to configure. Once connected to your wireless network, you can stream video and download apps from the Amazon app store. The Fire TV stick is not extremely powerful, but works perfectly fine as a digital signage player for static content such as cafe menus, sales ads, displaying static weather, meeting room signage, or even counter top signs that don’t require animated content. At a price point below $40, it is hard to beat for a low cost digital signage player. The Amazon Fire TV box is a bit larger, but can still fit easily behind a TV. The Fire TV box can be connected to a wireless network, or directly using a standard Cat5 network cable. It includes an optical audio out, which is great if you have an external sound source you would like to use. The Fire TV box is quite a bit more powerful and is great for displaying animated content such as real time social media posts, video, animated weather, web content, rss news feeds, and transitions between slides. You can purchase a Amazon Fire TV box for your digital signage player for less than $100 which is still a great deal to use as a digital signage player to help grow your business. To install the Mango Signage digital signage player on your Amazon Fire TV, simply go to the apps section, and search for “Mango Signs”. You can also find it at the Amazon App Store here. Once you launch the Mango Sign app, you will be presented with a code word. Use this code word to link your new sign to your account at mangosigns.com. * Please note that for 24/7/365 playback we recommend using an Android or Windows device. Amazon based players are typically used and recommended for temporary signage usage and require for the app to be manually started.